Pasta, one of the most satisfying foods in the world, is rarely made at home fresh anymore. We typically buy the dried version in the store, which is a good substitute, but certainly different from its fresh counterpart. Roll the dough and cut it according to the pasta maker’s directions. 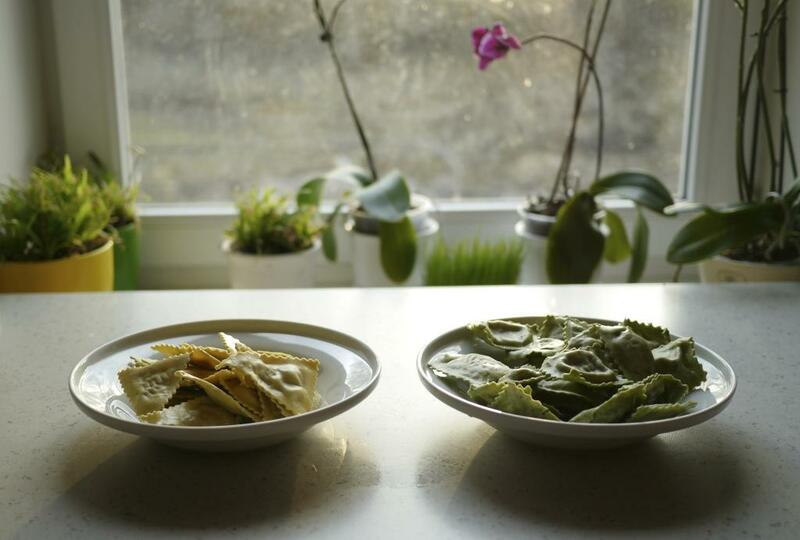 For herb-scented pasta: purée 3 tablespoons of your favorite fresh herbs with the olive oil. 3 tablespoons of porcini powder. “Hang” the tomatoes in a china cap set over a stock pot in the refrigerator for at least two hours or up to over night. In a large sauté pan set over medium high, heat the oil until just smoking. Add the lemon juice, zest and white wine and reduce the liquid until only about two tablespoons are left. Add the tomatoes and heavy cream and cook just until heated. Add the basil. Season with salt and pepper and serve over warm pasta immediately. In a large bowl, cream the goat cheese with the back of a large spoon. Stir in the chives and black pepper. In a small sauce pan set over low heat*, cook the whole garlic cloves in the olive oil until aromatic and soft, approximately 15 minutes. Allow to cool to room temperature.